A huge shout to today's VetGirl guest blogger is by Dr. Nicole Heinrich, DACVD of McKeever Dermatology Clinics. The hot topic in the world of dermatology right now is Apoquel. Apoquel is an exciting new medication for the treatment of allergic itching in dogs. It has a different mechanism of action than steroids, cyclosporine, antihistamines, allergy shots and sublingual immunotherapy. Apoquel suppresses part of the immune system through the Jak/Stat pathway. 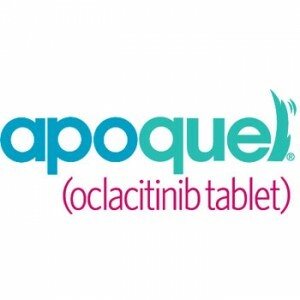 Apoquel is given by mouth twice daily for 2 weeks, then once daily thereafter. Apoquel is metabolized and eliminated quickly from the body. Some dogs experience a pruritus breakthrough within 12 to 18 hours of receiving an Apoquel dose. More than 80% of dogs will experience itch relief when Apoquel is administered twice per day. Approximately 60% of dogs will experience itch relief with once daily dosing. Apoquel works as quickly as steroids in many dogs. If the itching is not controlled within one week, then it is unlikely to be effective. The conundrum occurs with the allergic patient whose itching is controlled with twice daily dosing, but not once daily dosing. We still do not know how imperative it is for dogs to strictly adhere to the q 24 hours dose for chronic use. Some allergic dogs will use Apoquel as part of combination therapy. Apoquel can be combined with antibiotics, anti-fungals, antihistamines, topical steroids, allergy shots and sublingual immunotherapy. Apoquel does not interfere with allergy testing. We have combined Apoquel and short-term oral steroids with no apparent problems. No data is available for concurrent cyclosporine and Apoquel use. At this time we are avoiding that combination. Side effects include possible bone marrow suppression in dogs receiving higher doses. About 10% of dogs will experience diarrhea. Apoquel is not for use in dogs less than one year of age or dogs with systemic infection. We monitor Apoquel with a CBC/mini chemistry after 1 month, then CBC/chemistry/UA after 6 months of use. We may monitor CBCs more frequently in a patient using Apoquel off label. This is a promising medication to replace steroids in many itchy dogs! I have heard that there can be an increased occurrence of pneumonia and some rumors. Is this true? We have used apoquell a bit in the uk and agree with all of the above. We have however seen a number of dogs get demodex mites after using it. Not sure if this is your experience or our bad luck. It is however mentioned on our datasheet as a possible complication. Great medication so far. It’s just a shame that it is not readily available. I dread the day that I am told that it will not be in stock for my dog. I love this drug, my Pfizer rep gave me a sample for my own pet (15 yr old shih-tzu life long derm dog). It’s a shame this wasn’t available sooner. I am far more comfortable with this than steroids for his itch. It works well. We started with a higher dose and then a maintenance dose of 1/2 tab po eod…the difference in his skin is amazing! I was able to start a handful of dogs on it last winter and over the spring and summer – for the most part, it’s worked extremely well and clients have been very impressed and happy with it. Even owners with dogs with mild itch and figured they just had to live with it have been surprised by how much more comfortable their dogs are. I love that I can use it in conjunction with NSAIDs in dogs that also have arthritis. I’ve had very few clients NOT want to keep their chronic allergy dogs on it. Unfortunately it’s been hard to get and keep in stock and we haven’t always been able to get even the minimal amounts Zoetis has allotted to us. I really hope Zoetis gets this issue resolved and doesn’t keep dragging us along!